The Preble County Art Association is accepting designs from individuals or teams to be chosen to paint one of 10 pigs for this year’s round of Oinkers for Art. EATON — The Preble County Art Association is in it fifth year of Oinkers for Art, a public art project which integrates the community in the process of creating and displaying 10 painted pigs. The Art Association is accepting designs from individuals or teams to be chosen to paint one of 10 pigs. Teams will paint their pigs at the Downtown Eaton Inc.’s Old Fashion Car Show on Aug. 25. All painting must be completed in the allotted time. Painted pigs will be display downtown until the PCAA’s Arts Night Out on Sept. 28. 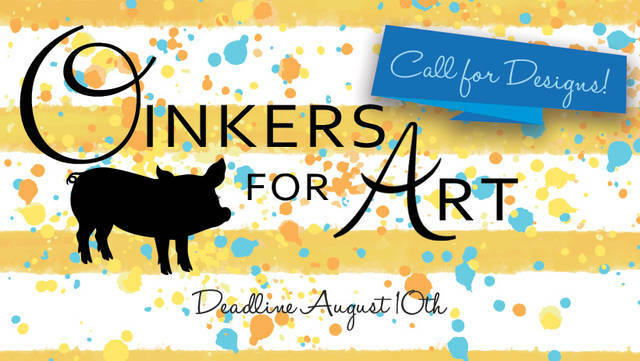 The PCAA is looking for the 10 best design submissions to be painted for this year’s Oinkers for Art. The contest is open to everyone of all ages. Artists, families, organized groups or businesses are all encouraged to submit designs. Teams can also be formed but can have no more than 5 people per team. Designs must be submitted to be considered for the competition and submitted with an entry form. Deadline to enter is Aug. 10. Questions? Want to pick up a form? Call 937-456-3999 or stop in at 601 Hillcrest Drive. The Art Center is open 1-6 p.m., Tuesday-Friday. Details for this event can be found at www.preblearts.org. https://www.registerherald.com/wp-content/uploads/sites/41/2018/07/web1_oinkerbanner-1-.jpgThe Preble County Art Association is accepting designs from individuals or teams to be chosen to paint one of 10 pigs for this year’s round of Oinkers for Art.